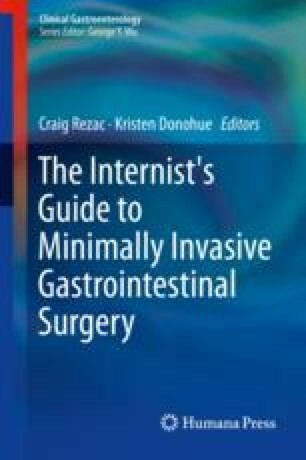 This text sets out to describe the many indications for and benefits of minimally invasive surgery (MIS) for the GI tract. This is by no means an exhaustive reference but meant to serve as an informative guide to appropriate patient selection and referrals. Minimally invasive surgery is often requested by patients, and we hope that this text serves as a reference for which patients would be candidates, what type of recovery and limitations to expect, as well as contraindications for minimally invasive approaches. We will briefly discuss the history and evolution of minimally invasive techniques. The general benefits of minimally invasive approaches will be referenced, and we will delve into more detail within individual chapters with regard to specific procedure types. Finally, there are many new and exciting tools on the horizon, and we will touch upon the future of minimally invasive GI surgery. Schwenk W, Haase O, Neudecker JJ, Müller JM. Short term benefits for laparoscopic colorectal resection. Cochrane Database Syst Rev. 2005;2:CD003145. https://doi.org/10.1002/14651858.CD003145.pub2.